The destruction of Jerusalem and the Second Temple occurred way back in 70AD. Yet the desire for Zion has continuously burned in the hearts of the Jews throughout the centuries in exile. One might even say that Jerusalem is written in their DNA. Though Jerusalem was rebuilt as a Roman city in 135AD - and except for the crusade periods - it has lain fallow, largely forgotten by the world for centuries. Photos of the Temple Mount taken at Israel's recapturing of Jerusalem during the 1967 Six Day War attest to its desolation under Islamic jurisdiction. It was only after Israel's historic victory that the world cast its collective eye on Jerusalem once again. I rather imagine a vision of Sauron sitting in his Dark Tower discovering the location of the Ring and suddenly turning all his attention to it. From a secular viewpoint it is remarkable that in recent years it has become such an intense focal point of conflict, drawing global attention. Why would western nations bother about what happens in a far away place? Why does the United Nations conspire to remove Jewish history from Jerusalem? The United Nations is an Islamic devotee. Despite the terrorism associated with Islam, its demands are appeased, and it seeks to purge Israel from the region. It is because of the Jewish presence that Jerusalem has once again become a precious jewel to be protected from the Jew. While you're standing there in rapt wonder you may also note the denial of Christ inscribed on its walls. Unless you want to shatter that "peace and tranquility," make doubly sure you don't get caught praying in Jesus' name as you admire the building. Why are some Christian leaders comfortable with an edifice in Jerusalem which denies Christ, but not a Jewish Temple? Rossing didn't say. But she isn't alone. Reformed Theology has served Christianity admirably in expounding the glory of the Triune God in Scripture. Unfortunately, its "new Zionism" is carryover baggage from Roman Catholicism. Why else would these theologians struggle with straightforward eschatological passages such as Acts 1:6-7? We're told we no longer need an outward physical temple (i.e., Jerusalem) to worship in because we are all temples of God (John 14:23; 1 Cor 6:19). This is true. Ironically Christians have buildings used for corporate worship. Roman Catholics have Rome. Catholics and Protestants alike have their Cathedrals. It isn't an either or proposition. There is a spiritual and physical dimension to the kingdom. In The Greatness of the Kingdom (p 520), Alva McClain tells the story of a non-premil preacher who was denouncing the carnality of a proposed millennial kingdom (as Augustine did). McClain noted that he was doing so while generously helping himself to fried chicken. Could we not, then, have a godly Millennial Kingdom which involves eating and drinking? McClain also noted the irony of those who propose to influence society through moral and political means in the "present kingdom." Why, then, cannot the rule of God be applied by the Mediatorial King during the millennium? That there will be a future temple in a physical location is supported by a straightforward reading of Scripture. Some theologians appeal to complex allegory and supersessionism, not to defend Scripture, but to protect a presupposed theology. Jerusalem cannot be expunged from eschatology. In The Temple and Bible Prophecy (p 524), Randall Price suggests several verses supporting a Millennial Temple. Joel 3:17-18 contradicts Walker's assertion that Zion must be understood as Christ. These verses speak of Zion as a future dwelling, and a fountain flowing from the "House of the Lord." See also Isaiah 2:3, 60:13 and Haggai 2:7, 9. In Matt 24:15, Jesus warned of a future Abomination of Desolation standing in the holy place. That this is speaking of a temple is confirmed by Jesus' referring to Daniel (Dan 9:27, 11:31 and Dan 12:11). Paul further corroborated this future abomination by an individual in "the temple of God" (2 Thess 2:4). Unless one takes liberties in spiritualizing the texts, there's no evidence that what was spoken by Jesus and Paul was fulfilled in 70AD. Some claim a future Jewish temple cannot be deemed holy. But if the Jerusalem Temple was no longer "holy" after the Cross then how does one consistently apply Matt 24:15 and 2 Thess 2:4 to the events of 70AD. Amillennialist Riddlebarger deals with these problems by asserting that there is no gap between the 69th and 70th week. According to him the first half of the 70th week involved the three-and-a-half years of Christ's earthly ministry. Riddlebarger then arbitrarily squeezes the entire church age into the last half of the 70th week! Premillennialist Robert Duncan Culver (Daniel and the latter Days) notes that the very language of Dan 9:26-27 specifies that the cutting off of Christ and the destruction of Jerusalem, not only follows after the 69th week (v26), it also precedes the 70th (v27). Culver's study of Daniel is recommended reading and can be accessed online. See also John Walvoord's Daniel the Key to Prophetic Revelation. Zechariah refers to Jerusalem as a stumbling stone in which all who come against it shall be cut in pieces and destroyed (Zech 12:3, 9). The future tribulation is designed to show Israel that it can only trust in the Lord, not its so-called allies (Zech 14:3-4). God will answer their call when they recognize their Savior (Hos 5:15; Zech 13:9; Matt 23:39). The focal point of this future conflagration is Jerusalem. Compare Zech 14:4, 12; Joel 3:14-16; Matt 24:15-30 and Rev 16:14. Note the mourning of the tribes in Zech 12:10 and Matt 24:30. Not only didn't Israel mourn for their Savior in 70AD but they didn't ask Him to return at that time either. After the Messiah's return, Jerusalem will become the center of government of the Millennial Kingdom. See Isaiah 60:12-14, 66:20 and Zech 14:16-19. Christians look to a Heavenly City and Kingdom at the moment, yet the heavenly New Jerusalem will descend to a physical location on the new earth. See Heb 8:1-2, 12:22; Rev 16:17, Rev 21:1-2. This location won't be in New York, Rome, London, Mecca or Paris. 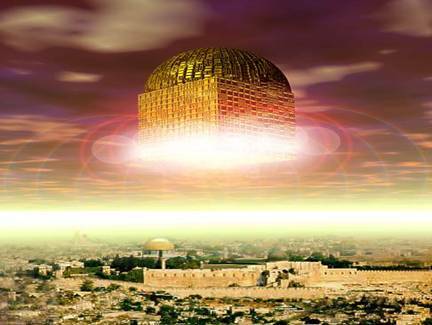 The headquarters of the future Kingdom of God in the Eternal State will be Jerusalem. It is only by respecting God's eschatological plan that we can understand the dynamics which drive world events. Why is Jerusalem such a jealous hot-bed of conflict? Why do the nations constantly rage against Israel? Why is there a steadily growing desire in Israel for a Jewish Temple? The Lord returns when Israel repents. When Jesus returns Satan will be incarcerated (Rev 12:12, 20:1-3) Jerusalem is at the epicenter of a Cosmic Battle which will ultimately usher in God's Kingdom. It's all in God's Word. Read it and believe what it plainly says. Jesus Christ is God. He has always existed. "In the beginning was the Word, and the Word was with God, and the Word was God." John 1:1. It can be difficult to wrap our human minds around this fact, but there is no doubt about what John is telling us. We live within time restraints so we can only look back into history, be aware of our present, and look forward into the future. God has no such restriction. He knew that Adam would sin and that the only cure for the death that resulted from that sin was for God Himself to enter creation as a human and become our once for all sacrifice. "And the Word was made flesh, and dwelt among us, (and we beheld his glory, the glory as of the only begotten of the Father,) full of grace and truth." John 1:14. There are many false gods that people worship but they're all dead (i.e. Buddha) or are demons (i.e. 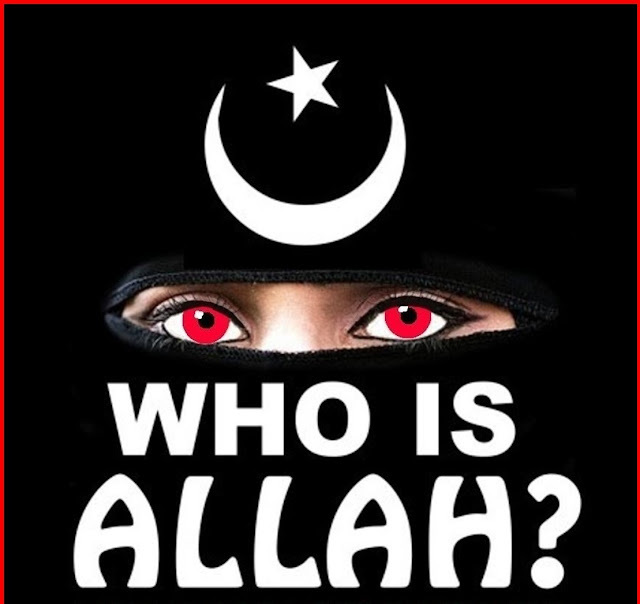 Allah). Jesus was crucified and His blood was shed for the remission of sins, but He rose from the grave. "And he took the cup, and gave thanks, and gave it to them saying, Drink ye all of it; for this is my blood of the new testament, which is shed for many for the remission of sins." Matthew 26:27-28. Jesus said these words at the last meal He ate with His disciples, soon after which He was crucified. He would have just been another man who claimed to be a god except He was God and three days after His crucifixion His tomb was empty. It had been sealed and a Roman guard was there to be sure no foul play took place. After the Resurrection Jesus appeared to many people and when He entered a closed room where Thomas saw Him, Thomas was overwhelmed. "And Thomas answered and said unto him, My Lord and my God." John 20:28. Yes, Jesus is alive and He is our Lord and our God. The New Testament gives many accounts of Jesus being seen after His Resurrection. For instance, two disciples travelling to Emmaus had a long talk with Him and He gave them an Old Testament study about how it all points to Him. He entered a locked room where His disciples were and a week later re-entered that same room to dispel any doubts that Thomas had. Jesus needed to be sure that the men He had chosen understood what they were to do so He continued to teach them "Until the day in which he was taken up, after that he through the Holy Ghost had given commandments unto the apostles whom he had chosen: to whom also he shewed himself alive after his passion by many infallible proofs, being seen of them forty days, and speaking of the things pertaining to the kingdom of God." Acts1:2-3. There's no doubt that Jesus conquered death and lives. His last words to His disciples before He ascended into Heaven was to spread the Gospel. "And he said unto them, Go ye into all the world, and preach the gospel to every creature. He that believeth and is baptized shall be saved: but he that believeth not shall be damned. " Mark 16:15-16. Baptism won't save, but it is a work of obedience. Only unbelief will condemn a person. We must share the Gospel. Our Saviour is alive and has purchased our salvation at a great cost to Himself so we need to serve Him well. Salvation is a free gift, but it comes with responsibility. Because Jesus did so much for us we need to show our gratitude by doing good works. Jesus directed us to share the Gospel with the world, and those first Christians did a great work as they went out and witnessed to others. The persecution in Jerusalem forced them to flee, but that helped to spread the Gospel to many places that wouldn't have been so easily reached. "Then Philip went down to the city of Samaria, and preached Christ unto them. And the people with one accord gave heed unto those things which Philip spake, hearing and seeing the miracles which he did. For unclean spirits, crying with loud voice, came out of many that were possessed with them: and many taken with palsies, and that were lame, were healed. And there was great joy in that city.." Acts 8:5-8. We shouldn't be surprised that people respond when the Gospel is preached. Today we hear of so many "missionaries" who go into the "mission field" but preaching the Gospel is somewhat of an afterthought. I once knew a man who was a missionary to India. He told stories of how dangerous it was there for a Christian. Then he began telling what his "mission" truly was. Instead of preaching the Living Saviour to people who needed to hear it, he was converting those who had already accepted Christ to his particular denomination. He had dead faith. Many others will try to blend in with the culture and timidly bring up Christ if an opportunity opens up. Philip "preached Christ unto them", and that's what missionaries should do. He preached the living Saviour and got results. Make no mistake, the Gospel is to be preached to the lost even if they're in your own neighborhood. Persecution against Christians was great, but they wouldn't be silenced. Multitudes of people came to faith through the preaching of the Gospel and their love for each other was evident in their works. "And the multitude of them that believed were of one heart and of one soul: neither said any of them that ought of the things which he possessed was his own; but they had all things in common." Acts 4:32. These people cared for each other. They helped each other when there was a need, which was a great witness to unbelievers. Instead of telling fellow Christians to depend upon the government or outside resources for help, Christians took care of Christians. No wonder there's so much dead faith today...Christians don't care for each other as demonstrated to us in the Bible. The early Christians preached the Gospel to unbelievers but directed their works towards fellow Christians. "Neither was there any among them that lacked: for as many as were possessors of lands or houses sold them, and brought the prices of the things that were sold, and laid them down at the apostles' feet: and distribution was made unto every man according as he had need." Acts 4:34-35. Don't misunderstand, it isn't wrong to do good towards unbelievers, but we seem to forget that it's the Gospel we're directed to give them...introduce them to the Living Saviour. 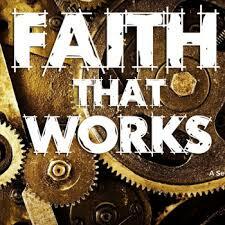 Many Christians today get confused when it comes to faith and works. We have faith that Jesus is alive and works should follow our faith. "And these signs shall follow them that believe; in my name shall they cast out devils; they shall speak with new tongues; they shall take up serpents; and if they drink any deadly thing, it shall not hurt them; they shall lay hands on the sick, and they shall recover." Mark 16:17-18. These are the works that should follow faith. The first Christians took Jesus seriously and shared the Gospel with everyone. As they stepped out in faith they were honest and straight forward. Their mission was to share the Gospel with the lost and Jesus said signs should follow. They didn't hide behind works to share the Gospel but were upfront. They didn't build houses or give gifts hoping for an opportunity to mention Jesus, but they immediately spoke of the Gospel. The Living Christ was preached and people responded. Many people today don't rely on the Holy Spirit. "And they were all filled with the Holy Ghost, and began to speak with other tongues, as the Spirit gave them utterance." Acts 2:4. That power of the Holy Spirit is lacking today, not because it isn't available but most Christians don't care. Instead of serving the living Lord daily, we settle for dead faith. We sit in a pew for an hour on Sunday and call it good. Life wasn't easy for those first believers. They were rejected by their families, their jobs were jeopardized, and speaking about Jesus was forbidden. That sounds a lot like today. A young man named Stephen was one of those early believers. "And Stephen, full of faith and power, did great wonders and miracles among the people." Acts 6:8. That same faith and power should fill us today. We're too easily discouraged and distracted by the world. Stephen didn't allow opposition to stop him, even when he was stoned to death for speaking of Jesus. Stephen's faith was alive and his love for Jesus was heard by the Jewish leaders who accused him of blasphemy. "When they heard these things, they were cut to the heart, and they gnashed on him with their teeth. But he being full of the Holy Ghost, looked up stedfastly into heaven, and saw the glory of God, and Jesus standing of the right hand of God, and said, Behold, I see the heavens opened, and the Son of man standing on the right hand of God." Acts 7:54-56. He saw the living Saviour! The eyes of the others around him were blind to the sight, but that didn't stop Stephen from speaking truth. Neither should we be intimidated by the blindness of those around us. Our faith in our Living Saviour should never be stifled by the attitudes of others. Someone just might respond to our faith and accept Christ for salvation. In fact Saul, the man who would later be known as Paul, was holding the cloaks of those throwing the stones at Stephen. He witnessed Stephen's faith. The Apostle Paul is a great example of how the Gospel should be spread. Once he met Jesus Christ he was impelled to spread the Gospel. He made many missionary trips and introduced innumerable people to Christ. Paul didn't hide the Gospel behind "good works" toward the lost but went directly into synagogues and met in pagan surroundings to share his faith. Some Christians supported his mission journeys by giving directly to him, but when he asked for money to be collected it was to aid fellow Christians. "Now concerning the collection for the saints, as I have given order to the churches of Galatia, even so do ye...And when I come, whomsoever ye shall approve by your letters, them will I send to bring your liberality unto Jerusalem." 1 Corinthians 16:1 & 3. Collecting money to directly help needy Christians (saints) with no middleman is the example we should follow. Paul didn't collect money to give gifts to non-believers but preached the Gospel to the lost and did what he could to help fellow Christians. Today our widows, orphans, elderly, and brethren in need are expected to depend upon "Big Brother" for help. Government assistance has replaced Christians helping Christians so it's no wonder faith is dead. We put other gods before our Living Saviour and where our treasure is our heart follows. When a person accepts Christ a change should happen. Paul said "I am crucified with Christ: nevertheless I live; yet not I, but Christ liveth in me: and the life which I now live in the flesh I live by the faith of the Son of God, who loved me, and gave himself for me." Galatians 2:20. If you don't recognize that Christ lives in you then how can your faith thrive? You won't accomplish anything for Christ and your joy in the Lord won't exist. That's exactly what Satan wants, dead faith evidenced by angry, sad, and depressed Christians who act like the world rather than a child of God. A person who has truly accepted Christ for salvation can't lose that salvation by anything they do or don't do. On the other hand, if your faith is dead then you're working for the enemy. If you're not living for Christ then you're living for the world and mocking Jesus. "But wilt thou know, O vain man, that faith without works is dead?" James 2:20. James wrote about faith and works and we need to pay attention. Doing good should be a result of our faith. Works won't save us, but we serve Christ by aiding fellow Christians and sharing the Gospel with the lost. "What doth it profit, my brethren, though a man say he hath faith, and have not works? can faith save him? If a brother or sister be naked, and destitute of daily food, and one of you say unto them, Depart n peace, be ye warmed and filled; notwithstanding ye give them not those things which are needful to the body; what doth it profit?" James 2:14-16. James is speaking about how we treat "brethren". We have a family commitment to aid our brothers and sisters in Christ. "Even so faith, if it hath not works is dead, being alone." James 2:17. Oddly enough, most Christians neglect our obligation to fellow Christians and forget we are to care for each other. There are plenty of Christians in your town who could use some help. I've recently been in need and been shown tremendous generosity from some fellow Christians. I may never be able to repay their kindness to me, but I can certainly pass on blessings to fellow Christians. Jesus is alive and lives in each of us but dead faith helps no one. Salvation is a gift of God but it comes with responsibility. Brothers and sisters, let's spread the Gospel to the lost and take care of the brethren. I do not know the Antichrist’s background or nationality, but I think I know his previous job before he takes over the presidency of the EU. (I’d better say the new Caesar’s throne). I got it from the interpretation of Revelation 17 verses 9, 10 and 11. The 7 hills represent Roman Catholicism: v 9. Wherefore the 7 heads that are 7 kings are 7 popes: v10. The clue to a proper interpretation is to be found in Rev. 17: 9, 10, 11. There we see 7 mounts that typify Rome, even Roman Catholicism, (v.9). Therefore, the 7 kings are the kings of Rome, i.e. the popes; the last 7 popes. “Five are fallen, and ONE IS, (i.e. this one is the Antichrist, the man of sin, the son of perdition), and the other is not yet come...”, (v.10). We could count these popes since the creation of the EEC, the former name of this present European Union which was born officially on March 25th 1957, when the Treaty of Rome was signed by France, Germany, Italy, Netherlands, Belgium, and Luxembourg. Bear in mind that the beast is formed by 7 heads (religious aspect: Roman Catholicism) and 10 horns (civilian and military aspects: The European nations). True it is that Pius XII was still on duty that year but it was his last year, and moreover this verse says that these 5 popes are fallen. What does it mean that they are fallen? I think it deals with the traditional attitude of Vatican toward the Jews. As a matter of fact Catholics are post-millennialist and their Replacement theology, i.e. interpreting the nation of Israel as their Holy Mother Church in all the prophecies concerning the glorious future of this nation, requires the nonexistence of any Hebrew State. 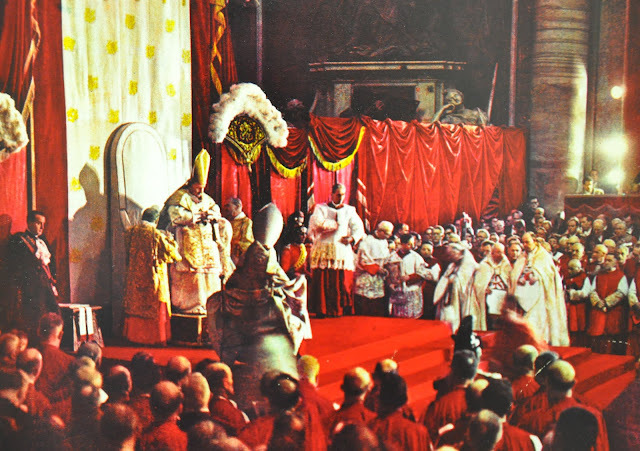 Pius XII was an ally to Hitler with whom he signed a Concordat in 1933, when he was yet known as cardinal Pacelli. (Actually he signed the treaty with Von Papen a devout Catholic and fervent Nazi, and the prelate Montini who became later Paul VI participated in the meetings). Pius XII never fell before the Jews, he always treated them scornfully and hatefully. After, if I am not wrong, should come Number 6; the Antichrist, the last emperor of the last Roman Empire. That man of sin should be followed by pope Number 7 for a short time, before Number 6 becomes pope Number 8, and claims to be God. (Some will say that I forgot Albino Luciani known as John Paul I, but he is not to be considered as a pope in this list of 7, for he did not reign as a pope because he refused to wear the pope’s mitre, which is the symbol of his supreme authority above all powers on earth; he just accepted the “pallium”; the rod that any bishop of any city holds, because did not want to be the bishop of the bishops. Wherefore after one month, during the year 1978. (He was probably murdered). Why is the Antichrist the sixth pope? Because verse 10 says about the sixth king: “and ONE IS”. It means: this one is the beast, the Antichrist, the man of sin, the son of perdition. This pope number 6 will do something that has already been done recently by catholic priests in South America. In Barranquilla, one of the biggest cities in Colombia, a priest called Hoyo, left his ministry so as to become the mayor running the affairs of the town hall. The same did, in Paraguay, the bishop called Lugo who was elected president of the Republic; he quit his religious ministry so as to be the president in charge of the Republic. Thus will do the pope number 6, he will leave his functions as pope, in order to run the presidency of the EU. Bear in mind that according to the Roman canonical laws, a priest, or a bishop or a pope, never loses his priest anointment, even if he leaves the ministry. There is a big international financial crisis today, and Vatican has more gold than the federal bank of the U.S.A. No wonder therefore if pope number 6 would rescue the euro zone financial system, in return for the presidency of the EU. He would then, leave his office as pope temporarily. Although I believe that terror will actually prompt the EU to surrender absolute power to this pope, the eschatological Antichrist. As a matter of fact, the vision of the wrath of the Lamb, which shall occur at the opening of the 6th seal, (Rev.6: 12 to 17), shall make the 10 horns, the governments of the confederate nations of the EU, “give their power and strength unto the beast”: Rev. 17: 13). Pope number 6 will become the permanent general president of the EU. but he will remain at the same time a pope “out of duty”. Therefore, in Vatican, they will elect a new pope (Number 7) to be in charge of the Catholic Church: “And when he cometh, he must continue a short space”. When Number 6 will take back his office as pope Number 8, Number 7 will retire or will be eliminated… (For years I thought that Pope # 7 could be the false prophet of RV, 19: 20, but recently I discovered that according to the Scriptures and to geopolitics the president of the USA could be the false prophet. We will see this later…) Number 8 who is also Number 6 will be then a genuine Caesar of the new Roman Empire; the supreme leader of that mega European state and will be worshiped as God, for he claims first to be the vicar of Christ on earth, afterward he will proclaim himself God on earth! He will renew with that blasphemous pretension that former Caesars of the old Roman empire used to impose on their subjects of total worship. Number 6 will be the complete beast on both sides; religious and political. “Nothing new under the sun” said the Preacher… Then shall be fulfilled the prophecy of Revelation 17: 11: “The beast, (the president of the European Union), which was, and is not, is also the eighth (pope), and he is amidst the 7, (since he was pope number 6, legally elected by the counsel of cardinals in Rome), and he goes to perdition (at the second coming of Christ Jesus)”. This is the interpretation I believe. Time will tell very soon, after pope Francis ‘demise, if it is a personal interpretation or a revealed interpretation! Now I would add something else about Daniel 7: 20 and 24 which interpretation seemed to me difficult till I saw a great, classical picture: “Left behind”, (the first chapter of that series). I do not agree with lots of things taught in this picture although it gives a good frame for unlearned believers in Millenarian eschatology. For instance, they have that the Antichrist will be the president of the UN whereas I see the Antichrist as the president of the EU, and as a former pope. They claim that the 10 horns which are 10 kings (Rev. 17: 12) are actually 10 governors of 10 global areas of the New World Order designed by the UN, whereas I say that these 10 governors are the presidents of the 10 nations which started the EU at Maastricht, and will finally be the real powers (the 10 horns) inside the new Roman Empire at the end of its history; the rest of the nations which now makes part of the EU being reduced to satellites that evolve around these 10 governors who shall be submitted to the son of perdition. But Daniel. 7: 20, 24 tells us that among these governors 3 of them will oppose the Antichrist. Mark well that the Antichrist being the pope, arises after them and was a small king of the small state of Vatican (v.8). Now this small king coming from Vatican will get rid of 3 governors at once. How? Well I think that Lalonde gave us the answer in his picture when we see the Antichrist killing 2 bankers during a session at the UN in New York. In that movie we see the Antichrist making a show of his power controlling the minds of the ten governors, killings those 2 bankers in front of them, and erasing on the spot that scene from their minds implanting instead a vision of the bankers killing one another during that summit. We are warned in Holy Writ that the man of sin will come “after the working of Satan with all power and signs and lying wonders, and with all deceivableness of unrighteousness in them that perish…and for this cause God shall send them strong delusion, that they should believe a lie” (2 Thessalonians. 2: 9, 10, 11). Therefore I believe that the Antichrist will kill 3 presidents of the EU so as to get total control of the new Roman Empire which shall lead the world into the New World Order and into perdition. It may happen during a summit as in the film “Left Behind” or in in other circumstances. God knows the whole picture, but he has given us the testimony of Jesus which the spirit of prophecy which enables us to understand together the words of the prophecy of this book, viz. the Bible. IT'S THE END OF THE WORLD, NOW WHAT? Hal Lindsey's been saying now for the better part of 50 years, that Christ's return is imminent, but I fear that for many, apocalypse fatigue is setting in. The "Left Behind" series sparked a huge renewed interest into the idea of the Rapture and for what follows, but even that excitement seems to have faded. With all the geo-political, economic, and technological changes happening every day, modern man's attention span is steadily decreasing. Increasingly, we express concern over the swelling anti-Christian sentiment that is growing here in the West, and express outright shock over the brutality of that same anti-Christian sentiment in the East. Half of Christianity wants to reclaim the world, this present world, for Christ and build His kingdom for Him, and the rest of Christianity is divided on how the end does happen. In fact, MOST of Christendom today, does not advocate the only doctrinal position that is logical, Biblical -- a Pre-Tribulational Rapture, otherwise known as our "Blessed Hope" (Titus 2:13). All that aside, the truth is that believers for millennia have long pondered, wondered about, and longed to see what the days we live in would be like. While our days may be increasingly onerous and dangerous, it is also exciting to see the pages of the prophetic scripture come to life right before our very eyes. And so it is both bitter and sweet, that we live to see these days come to pass, just as Christ, the prophets and apostles said they would. "But you, brethren, are not in darkness, so that this Day should overtake you as a thief. You are all sons of light and sons of the day. We are not of the night nor of darkness. Therefore let us not sleep, as others do, but let us watch and be sober...For God did not appoint us to wrath, but to obtain salvation through our Lord Jesus Christ, who died for us, that whether we wake or sleep, we should live together with Him (1 Thess 5:4-6, 9-10). So it is that we, the final generation, are called to stand firm in the growing tide of darkness which all the more enshrouds this fallen planet. But in our standing, we are to do four things which will not only bring glory to God, become a witness and a testimony to the lost, but will also encourage and embolden our brothers and sisters in these trying times. We are to worship, wait, work, and watch. For the born-again Christian, our worship is not solely limited to what we do in a church building on Sunday morning's, but it also involves how we live our lives. All of the life of every Christian should be an act of worship. The Apostle Paul, via the Holy Spirit, instructs us to present our bodies, our hearts, and our minds, to God as a living sacrifice. Once you become a believer in Jesus Christ, you are no longer your own, because you were bought with a price. (1 Cor 6:19-20) We are to become living sacrifices, crucifying the flesh daily, so that we may live in the Spirit. This is not easy, because the flesh becomes a powerful obstruction to our walk with God. Our primary goals as believers are to worship God, mature in the faith, and witness to those who do not know the Lord. We demonstrate our worship, by how we live our lives, by being a living sacrifice. We mature in the faith, when we learn how we live by our worship which by glorifying God puts our trust in Him, and not ourselves. Therefore our worship, becomes a living testimony to those who do not know Christ, and Christ said that if we would glorify Him, HE would draw all men to Himself (John 12:31-33). Anyone who has ever had to wait for anything, realizes that waiting is not fun. But waiting adds to faith in a way that immediate gratification cannot. It develops and matures you in your walk (sanctification) with the Lord. Abraham, who exhibited an amazing amount of faith, waited many decades for the promise of a son that the Lord would provide to both him and Sarah. Once that heir (Isaac) came and grew, God then instructed Abraham to take him to Mt. Moriah (modern day Golgotha/Calvary), making Isaac carry his own wood which Abraham would use to sacrifice him. This all seemed contrary to all that God had promised him, but Abraham was prepared to do this up until the point that the Angel of the Lord stayed his hand. Abraham demonstrated his faith that even if God had him kill his own son, God would raise him again or else God would be breaking his own promise (Gen. 15:1-5; 22:3-5). While the waiting was something that Abraham and Sarah struggled with, it developed and matured them. And our waiting is not in vain because "The Lord is not slack concerning His promise, as some count slackness, but is longsuffering toward us, not willing that any should perish but that all should come to repentance" (2 Peter 3:9). Anytime we lose sight of this, let us remember the day we came to Christ: what if God had chosen the day prior, to be the day of the Rapture? While we wait, let God develop us into the people He wants us to become. In our waiting, let us focus on the goal of running for the prize (1 Cor. 9:25; Phil. 3:14). Unlike the prosperity propaganda that many successful self-help televangelists love to promote, God has not called us to a life of luxury and riches. I am not saying that a Christian can't be wealthy, or that God can't bless us in those areas, because He can and He does. What I am saying is that that should not be our focus in life. While our fiat currency system may be a necessity to survive in these last days, it should not be what motivates us. That should not be what we strive for or yearn for. Wherever you are, and whatever you do, do it for the Lord. Don't do it so that other men can notice you, or that you do it for the accolades and praise of people, but serve God with a willing heart. What is increasingly perplexing to me, considering all that is transpiring around the world, is the outright rejection and denial of the Rapture and of Christ's Second Coming by those who claim to be Christian. I expect this from mainstream media, government, and pop culture, but how a denomination (take your pick) rejects 30% of their Bible, only to focus on everything BUT Christ's soon return, baffles my mind. -growing lukewarmness and apostate nature of "Christianity"
Literally, I could go on and on with what is going wrong in the world, but I think you get the drift. Many in Christendom would say pompously- "ahh that stuff has been going on since the beginning. Everything is cyclical, and we are just in another cycle of endless cycles-- when things get bad, then they get better, and then bad, and so on and so forth." I have spoken personally to many people and clergy who hold to this opinion. Ah, but the skeptic says, "Hey, that doesn't apply to me, Jesus (if He even wrote that), was speaking to some church in ancient Asia Minor. That has no relevance to me today." Notice what Christ says in the very next verse... "He who has an ear, let him hear what the Spirit says to the churches" (Rev. 3:4). We are called in these last days to stand firm and to be bulwarks in a growing storm that is increasingly and violently shifting and moving everything about. The only way we can stand firm is if we stand in Christ because in and of ourselves, we do not possess the ability, nor even the desire to go against the dark tide. It is not pleasant, especially considering what is coming upon the earth and in particular, what we have to look forward to so long as the Lord tarries. But we stand nonetheless, and we proclaim the saving power of the blood of Christ through worship, waiting, working, and watching. Some worship and work, but do not watch or wait for the Lord's return, and they quickly burn out. Some watch and wait, but do not work or worship, and they drift off into the fringe. We need all four to balance out our faith, because work is tiresome, and without the hope of our "Blessed Hope" we lose heart. All watching and no worship causes us to watch for anything, and soon our short attention span hearts, will drift into areas that appear more exciting or conspiratorial. We need all four because God built us to do all four, and when any of the four are missing, we drift from where God intended us to be. God built us with eternity in our hearts, and only the eternal can fully satisfy what we know is lacking in the here and now. There has been much discussion as of late on whether or not the United States is found in Bible prophecy. How does the world's most powerful, Christian, and Israel-friendly nation not warrant a mention as a key player in the last days? If the US is in Bible prophecy, what role does she play? If she is not, then why not? What happens to her vast natural resources, advanced technology, military arsenal, and able-bodied citizens? Considering these questions, there are biblically sound and astute teachers on both sides of the issue who either believe that the US is Mystery Babylon, or that we are not in the picture at all. Those in the camp of us being Babylon (mystery or otherwise), seem to make good points for that case (see here). Probably the strongest reason why we could be is that the Jews are told to come out of her. As of 2017, the largest concentration of Jewish people outside of Israel is in the United States. While at the same time, there are practically no Jews in what was traditional Babylon (Iraq) thanks to the likes of Al Qaeda, ISIS, and other militant Islamic groups. So how could they come out of her (Babylon), if they are not in there, to begin with? Those in the camp who believe we are not in the prophetic picture at all (see here) believe so for a variety of reasons. The most obvious reason for saying the US is not in Bible prophecy is that there is no explicit mention of any nation (in the geopolitical sense) that matches our description in the prophetic texts concerning the last days. While a number of doomsday scenarios could pose an existential threat to the United States, none (in my opinion) threaten to so suddenly upend the traditional global order as the Rapture of the Church. The threat has been gravely underestimated in books like the "Left Behind" series and other popular eschatological material. Underestimated not because of the percentage of how many Americans are raptured up, but by what immediately follows. Speculation abounds as to what the percentage will be for those believers who will be caught up. Some think as low as one percent while others think as high as twenty-five percent. The percentage then has become sort of a measuring stick by which we could determine whether or not the US survives the Rapture event and go on to play a major role in the 70th Week of Daniel. I tend to think around ten percent of the US population will be raptured, but even then that means around thirty million Americans (by current population standards) would instantaneously disappear. But regardless, the how is less important than the why in regards to our potential role in the Tribulation. What is of utmost importance is realizing that once the Rapture does occur, the restraining ministry of the Holy Spirit is also removed (2 Thess. 2:6-8). This does not mean that the Holy Spirit disappears from the earth altogether. The Holy Spirit is omnipresent and cannot, not be everywhere. The Holy Spirit was on the earth prior to the day of Pentecost and He will be here after the Rapture event. What it means is that the mystery of iniquity (or lawlessness) that is active in the world today, is at the same time actively being hindered by God's power through His people. We are salt and light to a world that will quickly be engulfed in darkness once the Rapture occurs. But after the Rapture, lawlessness will no longer be hindered. Lawlessness will go unchecked and the world will quickly move in one accord under the direction of Satan who will rapidly form that final world system. The first horse out of the gate is the man of sin riding the white horse. He seemingly takes advantage of a crisis already in progress. How long the crisis lasts between the Rapture and his arrival is unknown. We know that the actual 70th Week does not start at the Rapture, but with a covenant that is signed between Israel and the nations (Dan. 9:27) which he will ultimately violate halfway through. The man of sin will then become the son of perdition once Satan physically possesses him at the midway point. At present time, it is impossible for us to know who this man will be. We only know what the Bible says about him. However, his arrival likely comes at a point of great turmoil. So if the world's agenda is currently being hindered by God the Holy Spirit through the body of Christ on the earth, what does our removal then signify? A total lack of restraint. Unchecked restraint will result in turmoil and conflict and crisis. It should mean that the floodgates of hell are opened and there will be a short period of chaos immediately following the removal of the body of Christ (the Church) from the earth. This will force the power structures of the former world-order (pre-rapture) to realign themselves post-rapture. The old saying is that nature abhors a vacuum, and will fill itself with anything to avoid a vacuum. If the church's removal provides this vacuum, you can guarantee that something will fill this void. This is where I believe the spirit of antichrist becomes the strong delusion that sweeps over the world. Logically what comes with turmoil and change, is conflict. If we look back at World War 1 or World War 2, we see that the geopolitical realities changed significantly before and after each of these events. After the Rapture will be no different. The world will be forced to realign itself. IF the US is not impacted at all by the Rapture, then the current power structure (or the world order) will not need to change. But we do see great change coming because the next horse unleashed is the rider on the red horse. As I've stated in a previous briefs, that any belief system outside of true, orthodox Christianity, is from Satan. While the varying religions and worldviews may have different angles, forms of worship, terminology, etc., they are all varying corruptions of the truth. The reality then is that there is only one God, who is expressed in three Persons, who are all of the same divine essence and being, co-equal in power, and willingly submitting to each other to eternally be in one accord, according to Scripture. Anything that deviates from that is from Satan. In other words, it could have just as easily been Hinduism or Shintoism that was violently rampaging across the Middle East and Europe as it is Islam. Any view that is not true biblical Christianity, is fiercely (when confronted) opposed to the truth because of what it reveals about its corrupted nature. Without the Holy Spirit to keep the world at bay, the world will tear itself apart trying to establish a new dominant religious position. When peace is taken from the earth, what naturally follows is economic disparity and starvation. The rich and powerful have the means to keep their wealth and sustenance, while the rest do not. With starvation comes death and pestilence. The world population is currently at 7.5 billion people. While we can't know the percentage of those taken up at the Rapture of the Church, we can know (roughly) how many perish during the first four Seal judgments. A fourth of that is around 1.875B people. This is an unprecedented number and aside from the Noahic flood, we don't have anything else that can really compare to a number that large perishing in such a short period of time. That number alone will force major geopolitical alignments that will bring about the final world system headed by the Antichrist. I think that the biblically reasonable answer to the question of whether the United States is in Bible prophecy is that we are, but not in the way we hoped or expected. Although we are not Mystery Babylon, we will be essential to its creation. Every gentile power that has come about ultimately befriends and then betrays either the nation of Israel (and Judah) or the Jewish people. The nations will have to answer for this as well (Matt. 25:31-46). After the Rapture, the US will cease to look or be anything of like what it is today. I expect the US to become exceedingly anti-Semitic much the same way Europe rapidly became anti-Semitic in the early 20th century. The Jews will have to flee the United States back to Israel just as they did Europe between WWI and WWII. This is because the antichrist spirit will feed that supernatural hatred to a people who have been given over to a strong delusion. Satan's intent then is to gather the Jews into one place so to set a snare for destruction (Matt. 24:15-21, 2 Thess. 2:3-4). If Satan can destroy Israel, Jerusalem, the temple, and kill the Jews, then God's prophetic word will fail thus nullifying God's plan for Satan. At least, that is his plan it seems. Likewise, if the US ceases to be the world superpower, some other nation(s) will rise up to fill that void such as the revived Roman Empire. What's left of the US will be incorporated into that final world system. Without the constraints of the Judeo-Christian constitution, the US will dissolve relatively quickly. It would seem that either some catastrophic event occurs before Gog and Magog (Ezekiel 38-39), or after the Rapture, the US sees no intrinsic need to come to the aid of Israel. Either way, we are not willing to come to her aid. The antichrist and the false prophet simply do not have enough time left to build the world forces it needs to dominate the planet in only seven years. They will have to rely on taking from what's left of the major world powers through some advanced digital system (AI perhaps) to impose its iron-fisted will over the entire planet. Granted, even that time will be very brief as the forces from the east will eventually rise up to challenge his (antichrist's) authority (Rev. 16:12). WHY TEACH THE RAPTURE OF THE CHURCH? 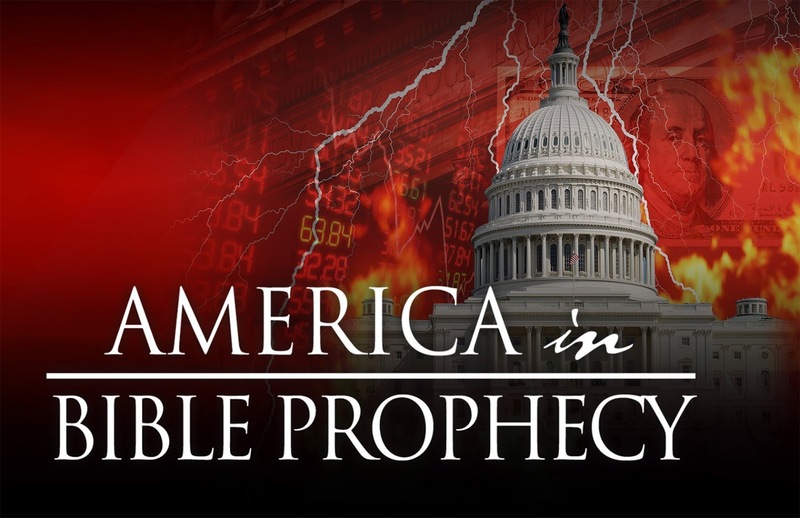 WHERE IS AMERICA IN BIBLE PROPHECY?